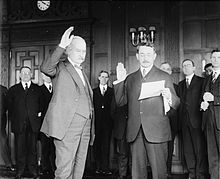 Albert Bacon Fall (November 26, 1861 – November 30, 1944) was a United States Senator from New Mexico and the Secretary of the Interior under President Warren G. Harding, infamous for his involvement in the Teapot Dome scandal. As a captain in the United States Army he supported a military invasion of Mexico in 1916 as a means of ending Pancho Villa's raids. Fall was born in Frankfort, Kentucky, to William R. and Edmonia Taylor Fall. He attended schools as a child in Nashville, Tennessee, but was primarily self-educated. By age eleven Fall was employed in a cotton factory. This is most likely the cause of respiratory health problems he suffered throughout his life. Due to his illnesses, Fall moved west as a young man to seek a better climate. He tried Oklahoma and Texas, but eventually he settled in Las Cruces, New Mexico Territory, where he practiced law. Between 1879 and 1881, he was a teacher while he studied law. On May 7, 1883, Fall married Emma Garland Morgan in Clarksville, Texas. They had four children: a son, Jack Morgan Fall, and daughters Alexina Chase, Caroline Everhart and Jouett Elliott. Jack Fall and his sister Caroline died within a week of each other during the influenza epidemic that swept the world in 1918. The family lived at the Three Rivers Ranch in the Tularosa Basin. Fall also had a home in El Paso, Texas. Fall was admitted to the bar in 1891. He served in the New Mexico House of Representatives from 1891 to 1892. In 1892 and 1893 he served on the territorial council. Fall was appointed judge of the third judicial district in 1893, and associate justice of the New Mexico Supreme Court later the same year. Fall served on the Territorial Council again from 1896 to 1897, and as the territory's attorney general in 1897. During the Spanish–American War, Fall served as captain of an infantry company. He again served on the Territorial Council from 1902 to 1904. He served as attorney general again in 1907. In 1910 he was a delegate to the territory's constitutional convention. Fall disliked Fountain, who showed little fear of the Fall–Lee faction, and challenged them openly in the courts and political arena. On February 1, 1896, Fountain and his eight-year-old son Henry disappeared near the White Sands on the way from Fall's Three Rivers Ranch north of Tularosa to their home in Mesilla. Fall successfully defended the men accused of the murder—Oliver Lee, Jim Gilliland and Billy McNew—at a trial in Hillsboro. Evidence at the trial suggested Lee was involved in Fountain's murder and disappearance, but investigators had to deal with a corrupt court system and Fall's legal skill. The bodies of Fountain and his son and their horse were never found, which hampered the prosecution. The charges against McNew were dismissed by the court, while Lee and Gilliland were acquitted. In 1908 Fall successfully defended Jesse Wayne Brazel, the accused killer of former Sheriff Pat Garrett. Garrett, famous for killing outlaw Billy the Kid in 1881, had pursued the suspects in the Fountain murders. As a member of the Republican Party, Fall was elected as one of the first U.S. Senators from New Mexico in the year 1912. It was widely known that he made a political alliance with Thomas B. Catron, the man who served alongside him, to ensure that both would be elected. This controversy made Fall a target of the local Republican Party, as they believed Fall had not contributed sufficiently to their efforts to secure New Mexico's statehood, and was not worthy of their nomination. The selection of Catron and Fall also disappointed Hispanics, who had hoped that one of their own would be selected. Fall was also severely disliked by Democrats. This came to a head when, under Senate rules, Fall's term was over in March 1913, so his name was again up before the legislature for re-appointment. After various votes, the legislature sent Fall's name to the governor. Governor McDonald, on the advice of his Democratic legal advisor, Summers Burkhart, said that the legislature's procedure had been illegal, and failed to sign the credentialing papers in an attempt to oust Fall by forcing a special session of the legislature and a new vote. It didn't work; Fall won the special legislative election. When re-election came up in 1918, Fall was ambivalent about running, but nonetheless accepted the Republican nomination. In the general election he overcame a bitter challenge from Democrat William B. Walton, even though Fall never made a campaign speech. Some commentators suggest that it was sympathy for Fall's tragic loss of his two children in the flu epidemic that won him the election. 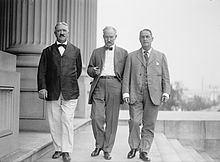 In the Senate, Fall served as chairman of the Committee on Expenditures in the Department of Commerce and Labor, was noted for his support of the suffrage movement and his extreme isolationist tendencies when the U.S. entered World War I. As a leading antagonist to Democratic President Woodrow Wilson, Fall was permitted to visit the stricken President in his White House bedroom in October 1919, hoping to gauge whether the Chief Executive was well enough to remain in office. "I have been praying for you, Sir," Fall sought to offer sincerely. "Which way, Senator?" Wilson replied, drawing laughter from his rival. After Catron retired following the 1916 Congressional elections, Fall lost his only local political ally. However, while in the Senate he had become close friends with the people who would later make up the infamous Ohio Gang, which secured him a cabinet position in March 1921. While local politicians opposed him, his popularity with the residents of New Mexico was reportedly very high. Fall was appointed to the position of Secretary of the Interior by President Warren G. Harding in March 1921. 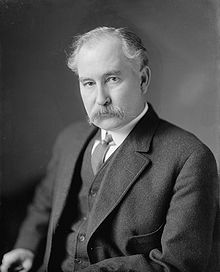 Soon after his appointment, Harding convinced Edwin Denby, the Secretary of the Navy, that Fall's department should take over responsibility for the Naval Reserves at Elk Hills, California, Buena Vista, California, and Teapot Dome, Wyoming. This last setting became the namesake of the scandal to erupt in April 1922 when the Wall Street Journal reported that Secretary Fall had decided that two of his friends, oilmen Harry F. Sinclair (Mammoth Oil Corporation) and Edward L. Doheny (Pan-American Petroleum and Transport Company), should be given leases to drill in parts of these Naval Reserves without open bidding. Sir, if you have a milkshake and I have a milkshake and my straw reaches across the room, I'll end up drinking your milkshake. The investigation found Fall guilty of conspiracy and bribery, $385,000 having been paid to him by Edward L. Doheny. Fall was jailed for one year as a result—the first former cabinet officer sentenced to prison as a result of misconduct in office. Doheny was not only acquitted on the charge of bribing Fall, but Doheny's corporation foreclosed on Fall's home in Tularosa Basin, New Mexico, because of "unpaid loans" which turned out to be that same bribe. Harry Sinclair was fined and served six months for contempt of court. Albert Fall died on November 30, 1944, after a long illness, in El Paso, Texas. He was buried in Evergreen Cemetery in El Paso. ^ Howard Francis Cline, The United States and Mexico (Harvard University Press, 1965), p. 178. ^ Twitchell, Ralph Emerson (1911) The Leading Facts of New Mexican History, Volume V. Torch Press, Cedar Rapids, Iowa, p. 122, OCLC 3828708. ^ Stratton, David H. (1998) Tempest over Teapot Dome: The Story of Albert B. Fall. University of Oklahoma Press, Norman, Oklahoma, pp. 146-152, ISBN 0-8061-3078-4. ^ Owen, Gordon R. (1996) The Two Alberts: Fountain and Fall. Yucca Tree Press, Las Cruces, New Mexico, USA, p. 398, ISBN 1-881325-20-2. ^ Stratton, op.cit. p. 151. ^ Owen, op.cit. p. 399, ISBN 1-881325-20-2. ^ Berg, A. Scott (2013). Wilson. New York, NY: G.P. Putnam's Sons. p. 661. ISBN 978-0-399-15921-3. ^ Rosenstone, Robert A., & Parvulesu, Constantin (2013). A Companion to the Historical Film. Malden, MA: Wiley-Blackwell. pp. 319–320. ISBN 1118322665. ^ "Senate Investigates the "Teapot Dome" Scandal". Historical Minutes: 1921–1940. Art & History, United States Senate. ^ Biographical Directory of the American Congress, 1774-1971. U.S. Government Printing Office (1971). A photograph of A.B. Fall together with Pat Garrett and others hangs in the Office of the New Mexico Supreme Court, in Santa Fe, NM. Wikimedia Commons has media related to Albert B. Fall. United States Congress. "Albert B. Fall (id: F000011)". Biographical Directory of the United States Congress.